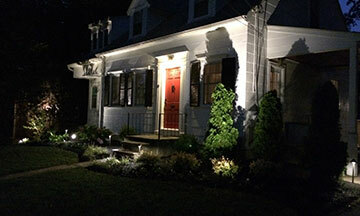 Learn how outdoor lighting affects your landscape. Whether your landscaping includes a path through your garden, a family pool, or an outdoor space meant for entertaining friends and guests, chances are that your home can benefit from outdoor lighting. Outdoor lighting can provide increased visibility for security purposes as well as allowing you to enjoy your outdoor spaces on long summer nights. Unfortunately, some homeowners have a misconception that outdoor lighting will ruin their lawn through messy installation or lawncare mishaps. But when you invest in a good quality outdoor lighting installation, these shouldn’t be issues at all. In fact, we’ve got a helpful guide to address your concerns about outdoor lighting and your lawn care. Here’s how outdoor lighting really affects your landscape. A primary concern of many homeowners when it comes to outdoor lighting and their landscape is maintenance. You may worry about a lawn mower or other routine lawn care tearing up a light and ruining your grass. However, with the right outdoor lighting installation, this can be easily avoided. The right placement of your outdoor lights will make sure they are visible enough that they should never get in the way of proper lawn maintenance. Some homeowners may be hesitant to outfit their landscaping with lights and the wiring that comes with them. But professional installation involves wire burial that actually saves your lawn. With a properly trained installer, you can be sure that the wiring will be handled in such a way that your landscape will not be damaged and your routine lawn maintenance can go on as scheduled. A trustworthy professional will not only bury the wires at a depth that won’t cause any problems for your lawn, but they will also be able to wire your outdoor lighting as efficiently as possible to minimize any potential issues and effectively connect your lights to the transformer. There is a wide range of products available to you when it comes to lighting your landscape. Whether you’re looking for stand-up path lights to light your lawn or garden path, or flat well lights that will light your trees or climbing plants, a quality light will not only be easily visible but also not be damaged by lawnmowers. A good quality well light, for example, will lay flush to the ground and cause no issue when it comes to day time lawn care. This entry was posted on Friday, April 5th, 2019 at 11:57 am. Both comments and pings are currently closed.